In many ways CT scanning works very much like other x-ray examinations. Very small, controlled amounts of x-ray radiation are passed through the body and different tissues absorb radiation at different rates. With plain radiology, an image of the inside of the body is captured when special film is exposed to the absorbed x-rays. With CT, the film is replaced by an array of detectors that measure the x-ray profile. 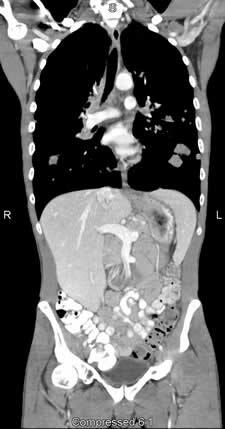 Because it provides detailed, cross-sectional views of all types of tissue, CT is one of the best tools for studying the chest and abdomen. It is often the preferred method for diagnosing many different cancers, including lung, liver and pancreatic cancer, since the image allows a physician to confirm the presence of a tumor and measure its size, precise location and the extent of the tumor’s involvement with other nearby tissue. CT examinations are often used to plan and properly administer radiation treatments for tumors, to guide biopsies and other minimally invasive procedures and to plan surgeries. CT can also play a significant role in the detection, diagnosis and treatment of vascular diseases that can lead to stroke, kidney failure or even death. In cases of trauma CT can quickly identify injuries to the liver, spleen, kidneys or other internal organs. CT can clearly show even very small bones as well as surrounding tissues such as muscle and blood vessels. This makes it invaluable in diagnosing and treating spinal problems and injuries to the hands, feet and other skeletal structures. CT images can also be used to measure bone mineral density for the detection of osteoporosis. Corvallis Radiology is excited to offer coronary artery CT arteriogram imaging. With the acquisition of a 64 slice CT scanner at Good Samaritan Medical Center, we offer this non-invasive highly accurate test. The test is useful for evaluating patients with chest pain, coronary artery bypass grafts, suspected coronary artery anomalies, and for pre-operative planning.